Welcome to Ottawa, the capital city of Canada. Rich with history, culture and prestigious educational institutions, Ottawa’s centerpiece is Parliament Hill, the home of Canada’s federal government and the heartbeat of Canadian politics. Today we are joined by a local guide as we embark on a sightseeing tour of this fascinating city. We start with a guided tour of Parliament Hill and the famed Centre Block. Designed and built in a gothic revival style and featuring national symbols of Canada throughout its design, Parliament Hill stands on the banks of the Ottawa River and is affectionately known by locals and politicians as ‘The Hill’. Our tour continues through Ottawa showcasing the Rideau Canal, a National Historic Site and UNESCO World Heritage Site, it is the oldest operational canal system in North America. The Rideau Canal system locks work to join the Ottawa River to Lake Ontario and the St. Lawrence River system. We conclude our city tour at the famed Byward Market where an array of local artisans showcase their wares. A wonderful place to enjoy your afternoon at leisure in Ottawa. Today we arrive in the province of Quebec, known as ‘la belle’ province, which has a predominately French speaking population. We arrive in Montreal, a fascinating city where modern cultural influences merge with history, located on its own island where the Ottawa River and the St. Lawrence River come together. An expert local guide joins us for a tour of Montreal where we discover the Old City, Mont Royal, the sites of EXPO 67 and the 1976 Summer Olympics, and the famed underground city and of course the incredible, ornate Notre Dame Basilica in the heart of the Old City. Continuing along the St. Lawrence River we arrive this evening in Quebec City, where we partake in a local tradition and indulge with dinner at a sugar shack. Sugar shacks, integral to the production of maple syrup, are used to boil the sap collected from sugar maple trees into Maple Syrup. We explore Quebec City today, whose history dates back to 1608 and is one of the oldest cities in North America. 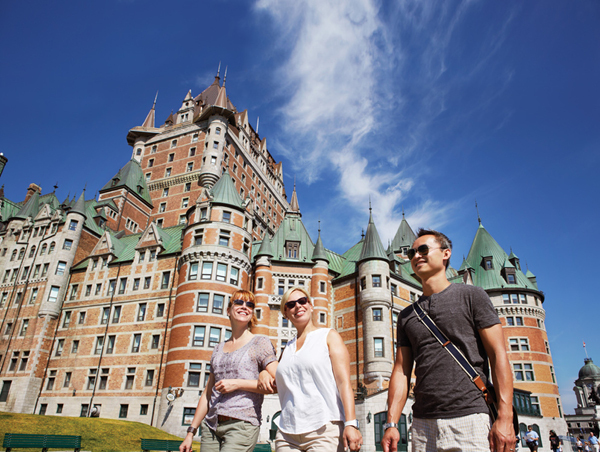 We discover Montmorency Falls, Plains of Abraham, the Citadel and the intriguing history of Old Quebec City on our sightseeing tour. See the famed Chateau Frontenac towers above the narrow cobblestoned streets of Old Quebec City, a UNESCO World Heritage Site, which feels as though you are stepping into a European village uniquely surrounded by the only fortified city walls in North America. Following our city tour, enjoy the remainder of the day at leisure in this fascinating city. Stroll the streets of Old Quebec, browse local boutiques or indulge in a local delicacy such as poutine, a hearty bowl of French fries and curd cheese covered in gravy or one of many maple infused treats. Our first stop today is the Albert Gilles Copper Museum, just a short drive outside Quebec City. Albert Gilles was a renowned master craftsman working with metal. Responsible for the creation of historic pieces for the Roman Catholic Church including some personally commissioned by Pope Pius XII. The Albert Gilles Copper Museum is now operated by his daughters who remain the artists in residence. We cross the St. Lawrence River and continue to the province of New Brunswick, the only constitutionally bilingual province in Canada. After a short drive we arrive in Edmundston and visit the New Brunswick Botanical Gardens showcasing 80,000 plants throughout 8 thematic gardens. Along the scenic Saint John River today our journey continues where we soon arrive at the Hartland Bridge. This covered bridge first opened in 1901 as a National Historic Site of Canada and the longest covered bridge in the world. This afternoon we step back in time at Kings Landing, a living history museum featuring buildings dating back to 1820. Enjoy a hearty lunch and tour of the site dedicated to showcasing rural life in New Brunswick during the 19th and early 20th century. This morning pay witness to the natural phenomenon that is Reversing Falls, on the Saint John River in the heart of Saint John, caused by the waters for the Bay of Fundy and Saint John River colliding. As the tidal water from the bay rises it forces the water to reverse flow creating whirlpools and rapids in the river. A true highlight lays ahead today as we arrive at Hopewell Rocks, also called the Flower Pots, standing 40-70 ft high emerged from the waters of the Bay of Fundy, only fully visible during low tide. The Bay of Fundy features the world’s highest tides at 50 metres high forcing 160 billion tonnes of seawater to flow in and out of the bay each day. Arriving at low tide, we have the opportunity to walk on the sea floor and experience the famous rocks up close. Departing Moncton today we stop at Magnetic Hill, a gravity hill that mysteriously pulls vehicles uphill against natural law. Our driver will turn the engine off, put the coach in neutral, release the brake and let nature take over. With no driver assistance, aside from steering, the hill will pull the coach upward! In Shediac, the ‘Lobster Capital of the World’, we indulge on board a cruise including a lobster lunch while learning the history of the lobster industry and even learning firsthand traditional lobster fishing techniques and practices. Later we cross the Confederation Bridge, a 12.9 km bridge linking New Brunswick to the province of Prince Edward Island. Confederation Bridge was constructed in the mid 1990’s and opened to traffic in 1997 to replace a ferry system that previously was the only link between the two provinces. A local guide will board our coach this morning as we embark on a sightseeing tour of Prince Edward Island that includes Green Gables Heritage Place, Cavendish National Park, and the fishing village of North Rustico, just to name a few. Anne, a fictitious character first charmed the world in 1908 when Lucy Maud Montgomery’s novel Anne of Green Gables was published. Captivating audiences far and wide, fans of the story travel from around the world each year to Anne’s Prince Edward Island home. Boarding the scenic Wood Island Ferry, we take a short cruise across from Prince Edward Island to the northern shores of Nova Scotia. Dotted with quaint fishing villages, the countryside of Nova Scotia has charming beauty. Alexander Graham Bell, most famous for inventing the telephone, was an inventor, innovator and considered a humanitarian by many. His life’s works are on display at the Alexander Graham Bell Museum and together we discover the incredible history of this man who helped shape modern communication. One of the world’s most scenic coastal drives, the Cabot Trail lies ahead of us today. With incomparable ocean views, surrounded by thick coastal forest the roadway winds along the rugged coastline through Cape Breton Highlands National Park to the northernmost tip of Cape Breton Island. A full day along the Cabot Trail allows time to stop at an assortment of eclectic local shops and scenic viewpoints which combine to create an authentic local experience that is sure to be a highlight of the entire journey across Canada. Halifax, a city whose history helped shape and define Canada is our destination today. Halifax was founded as a town in 1749, later becoming a city in 1842. Built around a large, natural harbour Halifax has played an important role in economic, military and migration activities throughout its history. Halifax’s storied harbour was an entry point for immigration in the early 1900’s when the majority of Canada’s immigrants first arrived at Pier 21 in Halifax harbour. Today we board a whale watching coastal cruise and get a chance to see the harbour and the surrounding coast up close while keeping our eyes peeled for marine mammals. A sightseeing tour with a local guide allows us to delve deeper into the history of Halifax as we experience the city through the eyes of a local. Our tour includes the Citadel, downtown Halifax, Old Town Clock and so much more as the guide brings the storied history of Halifax to life. Nova Scotia is home to 160 lighthouses, and we have the opportunity to see many of them as we travel along the coastal ‘Lighthouse Trail’ along Nova Scotia’s south shore before arriving at the most famous lighthouse in the province located at Peggy’s Cove. A lighthouse has stood on the shores of Peggy’s Cove since 1868, the current lighthouse and second to occupy Peggy’s Cove opened in 1915 and is still an active lighthouse today managed by the Canadian Coast Guard. Beginning our journey back west, we bid farewell to Nova Scotia and cross back in to the province of New Brunswick, we soon arrive in Fredericton. Fredericton, the capital city of New Brunswick is a small city with important history and culture which dates back 12,000 years to the earliest settlements in the area. Over the course of history, Fredericton has been both a French Colony and an English Colony; together we discover this history as a local guide takes us on a city tour of Fredericton. Continuing on, we once again arrive in Edmunston for our last night in Atlantic Canada. This morning we rejoin the path of the St. Lawrence Seaway as we travel to Montreal. Our journey along the area is perfectly timed to witness the colourful fall foliage of the changing season. Brilliant, red, yellow and orange leaves scattered among evergreen trees create an eye popping and enchanting sight. Montreal is the perfect city to enjoy an afternoon at leisure to explore. It is also a city that continues to evolve and thrive in a way that entices and intrigues every one fortunate enough to visit. Whether art, history, music or culinary creations peak your interest, you are sure to find it in Montreal. Today our journey takes us from Montreal to Kingston, Ontario. Kingston, known as the Limestone City for the number of granite buildings featured in the city, sits on the edge of Lake Ontario and is a gateway to the pristine Thousand Lakes region. We take a trolley tour of this historic city, the first capital city of the Province of Canada in 1841, which was then a British Colony. Our tour delves into the history of Kingston and concludes at Bellevue House, a National Historic Site of Canada and the childhood home of Canada’s first Prime Minister, Sir John A. MacDonald. Traveling south through the rolling countryside of Ontario, we arrive in Niagara Falls. 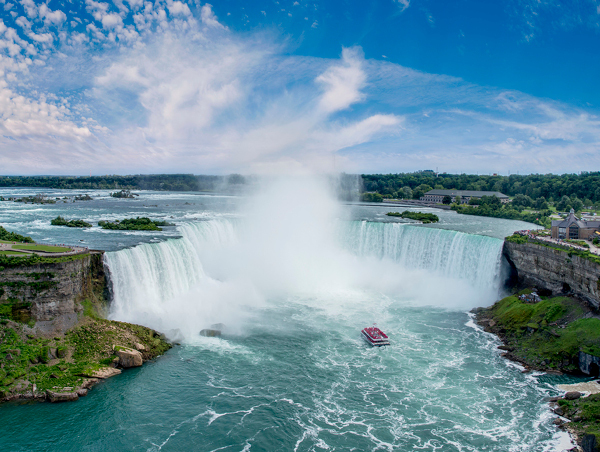 The self proclaimed ‘Honeymoon Capital of the World’, the city of Niagara Falls sits on the banks of the Niagara River and provides the perfect view of the famed falls – Horseshoe Falls, American Falls and Bridal Veil Falls. The three waterfalls straddle the international border of Canada and USA and collectively have the highest flow rate of any waterfalls in the world, with a vertical drop of more than 165 ft. To fully appreciate the power of these waterfalls, we board the Hornblower Cruise, formerly the Maid of the Mist, which allows us to cruise to the base of the thundering falls. After viewing from the falls from their base, we rise high above them for a spectacular view from the Skylon Tower as we enjoy dinner at the top this evening. The Niagara region, blessed with a unique climate and rich soil, makes for near perfect wine producing conditions. We visit Niagara-on-the-Lake this morning, a picturesque country town with dozens of local wineries, each with their own unique method and style in creating wine this region is known for. We will visit a local winery for a tour of their processes and of course to taste the finished product. This afternoon, we depart Niagara and travel to the mesmerizing city of Toronto, the most populous city in Canada and the capital city of Ontario. This evening is yours to discover what Toronto has to offer. Toronto is ours to discover today, on the banks of Lake Ontario, Toronto’s skyscrapers seemingly rise from the water and touch the clouds. Along with being a commercial and financial powerhouse, Toronto has also successfully positioned itself as a thriving artist community where music, theatre and movies come to life. Hosting the prominent Toronto International Film Festival (TIFF) every fall, Toronto shares the name ‘Hollywood North’ with Vancouver, a reference to the countless blockbuster movies filmed in Toronto each year. A tour of Toronto includes Yonge Street, the longest street in the world, Casa Loma, Chinatown, the waterfront and the CN Tower. The CN Tower was the world’s tallest free standing structure until 2007 when its title was taken by the Burj Khalifa in Dubai. 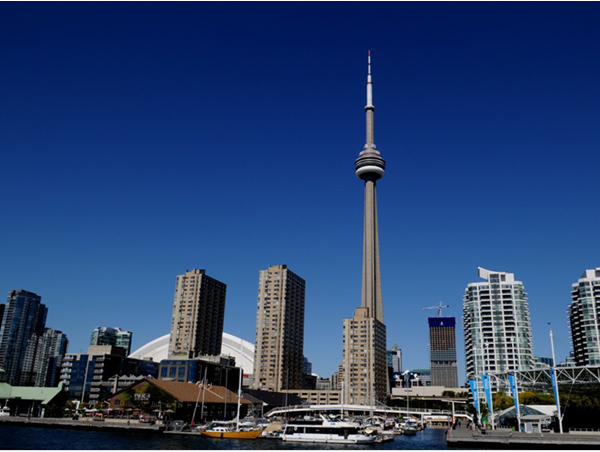 Although no longer the tallest in the world, the CN Tower remains an icon of Toronto’s skyline. This morning your incredible journey through Eastern Canada concludes as you bid farewell to your new found friends and depart with unforgettble memories of this amazing country.